The Republic of Serbia, especially its northern region, Vojvodina Province, is profoundly diverse in ethnic composition. According to census results, more than 20 ethnic groups live in Vojvodina Province. Ethnic groups that have more legal representatives are guaranteed the right for their language to become one of the official languages. According to the Constitution of the Republic of Serbia, the Serbian language was established as an official one with its Cyrillic script, but there is also official use of other languages and scripts: the Hungarian, Slovakian, Croatian, Romanian, and Ruthenian languages. Local government statutes have established languages and scripts that are in official use in certain municipalities, cities, or other inhabited places. During the previous century, changes in the ethnic structure of the population occurred, resulting in a change in the composition of the population toward the mother tongue. In the period after the foundation of the Kingdom of Serbs, Croats, and Slovenes, in 1918, when Serbia, together with Vojvodina Province, joined the new state, censuses were conducted every 10 years. In that period, the share of population with German mother tongue was significantly reduced, the share with Serbian mother tongue increased, and the shares with Slovak, Hungarian, Romanian, and Ruthenian were maintained, and their languages were preserved in Vojvodina. For the purposes of this research, quantitative analysis and statistical methods were used to analyze the data, and cartography was used for illustrative presentation of the results. Vojvodina is the autonomous province situated north of the Sava and the Danube rivers in the Republic of Serbia. It borders the Republic of Hungary in the north, the Republic of Croatia in the west and Romania in the east. The borders of the Republic of Serbia on the territory of Vojvodina Province are mainly nonnatural and nonethnic. The borderline was drawn in 1918, when the Kingdom of Serbs, Croats, and Slovenes was established, and it mainly runs through the lowland and crosses rivers, rarely following the flow of the rivers Danube, Begej, Tamiš, Tisa, and Nera (Rodić and Pavlović 1998). The border does not divide nations; rather Serbs live on the territory of neighboring countries, and nations from neighboring countries live on the territory of Vojvodina Province. Vojvodina comprises three micro-regions: Bačka, Banat, and Srem (Bubalo-Živković et al. 2017; Stojsavljević et al. 2013). Bačka is located between the Danube and the Tisa rivers, and it borders Croatia and Hungary. Banat is situated in the east and separated from Bačka by the Tisa river. Hungary is to the north of this micro-region, Romania to the east and the Danube river, and central parts of the Republic of Serbia to the south. The smallest micro-region is Srem, which is situated between the Danube river (to the north and east) and the Sava river (to the south). To the west of this micro-region is the state border with the Republic of Croatia. The three micro-regions of Vojvodina Province have different ethnic structures, which also impact the structure of mother tongue differences among the population. Primarily, there is a mismatch of an ethnic group population size to the number of mother tongue users for the same ethnic group population. Mother tongue is frequently the defining characteristic of ethnic membership. The population historically declared ethnicity by answering the mother tongue inquiry in the census. However, the censuses after World War II, from 1953 onward, record both mother tongue and ethnicity. Frequently, noticeable discrepancies occur between the number of ethnic group members based on their reported use of a particular mother tongue and the size of that ethnic group, due to the guaranteed right to freely declare ethnic affiliation and mother tongue. Besides their mother tongue, members of various ethnic groups tend to preserve their customs, cultural identity, and gastronomic variety, which have been granted for them in Serbia. Apart from the observed ethnic differences, certain ethnic groups have undergone uncontrolled mixing processes which further complicate the attempt of discerning certain groups by their cultural and customs characteristics. Mother tongue is the language used by an individual’s mother and that is also the language which the child uses first (Bugarski 2010). Mother tongue may also be some other language if the person identifies herself/himself with another language. In general mother tongue identifies individuals from their early stages of life, opening the door to cognition of the world we live in and defining each of us individually. It is the language in which individuals contemplate and which they use smoothly in every situation. The data used in this study were obtained from the 1921 census conducted by the State Statistical Board in Belgrade, the Kingdom of the Serbs, Croats, and Slovenes; the 1953 census of the Federal National Republic of Yugoslavia; as well as the data of the Statistical Bureau of the Republic of Serbia from 2002 and 2011. Since 1921, censuses have been conducted every 10 years, with the exception of wartime. There was no census in 1941 during World War II, but it was conducted later in 1948. The following one was conducted in 1953, then the next one in 1961. All other censuses were conducted at 10-year intervals, usually in the first year of the decade, except the 2002 census which was not conducted in 2001 due to the bombing of Serbia in 1999 which postponed proper preparation of the census. The population figures for Vojvodina are taken from the same four censuses. Significant changes were recorded around these time periods. 1921 was the first census conducted on the territory of the Republic of Serbia, having similar borders to its present ones, and it was the first census conducted on the territory of Vojvodina as part of Serbia. The 1953 census was the first to record data on mother tongue. The 1948 census did not collect data on mother tongue of the population, and thus it was not taken into account as the first census after World War II. The 2002 census illustrates changes that occurred in the second half of the twentieth century, as well as changes that followed the war in the 1990s and the bombing of Serbia. Huge emigration occurred in the first decade of the twenty-first century and had a profound impact on the population size of the country, and the changes were visible in the 2011 census. The next census, which is due in 2021, should show the impact of the large emigration from Serbia which continues in the present time. It is difficult to adequately compare the figures from all censuses due to the methodologies that were changed from census to census. For instance, the 1921 census was conducted, and data were processed pursuing the concept of “present population,” whereas the 1953 census recorded the population according to the place of residence, i.e., the concept of “permanent population.” Furthermore, in concordance with international recommendations, the 2002 census included not only the population in the country and the permanent population but also the population working abroad for less than a year, as well as foreign citizens working and residing as family members in the country for over a year (SORS 2003). For the purpose of determining the total population of a given area, the 2011 census incorporated the concept of “usual population” for the first time. According to this concept, a person is considered to be a resident of the place in which he/she alone (in case of a one-person household) or with the members of his/her household spends most of the time, that is, the day and night, irrespective of where this person has his/her residence registered. Thus the total population of a certain place includes the persons who have lived in that place continuously for at least 1 year before the critical census moment, as well as the persons who have lived in that place for less than 12 months, but with an intention to stay there for at least 1 year (SORS 2013). It was in 1921 when data for the first census were being collected on the territory of the Kingdom of Serbs, Croats, and Slovenes that mother tongue inquiry was the criterion for determining national identity, similar to other censuses conducted not only on the territory of Serbia but also on the territory of the Austria-Hungary Empire (DSS 1924; Bubalo-Živković and Đerčan 2014). The definition of mother tongue applied in the 1921 census differed somewhat from the definitions applied in the 1961–2011 censuses. In the 1953 census, mother tongue was defined as the language mainly spoken by the person in his/her household, that is, the language which the person itself considers as his/her mother tongue. In all subsequent censuses, mother tongue means the language which a person learned to speak in his/her earliest childhood, that is, the language the person considers his/her mother tongue, if several languages are spoken in the household. 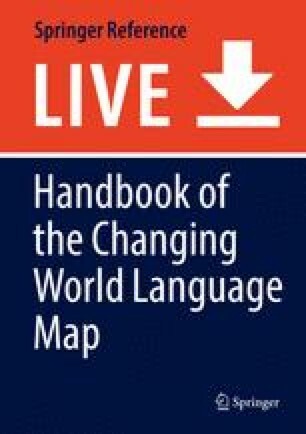 The classifications of mother tongue differed from one census to the next, and they mostly followed the changes in the classification of ethnicity. Thus, for instance, new modalities of mother tongue were introduced in the 2002 census, Bosnian, Tsintsar, and Chinese, analogue to the corresponding changes in the classification of ethnicity. The 2011 census was specific for having the classification of mother tongue expanded by three more modalities, including the languages of Bunjevci, Armenian, and Montenegrin (SORS 2013). It is necessary to highlight that the census ethnicity questions were formulated as open-ended questions with the legal advice that according to Article 47 of the Constitution of the Republic of Serbia, national affiliation may be expressed freely. Thus, the 2011 census ensured the highest international standards according to which national affiliation is freely expressed (SORS 2012). In addition to the freedom of expressing national affiliation, individuals are also guaranteed freedom of expressing the mother tongue they use. The aim of this study was to assess the differences that occurred in the population structure over the last century with regard to mother tongue and, further, to determine the differences between population represented by mother tongue and national affiliation. Descriptive statistics were used to analyze the population by mother tongue and ethnic groups. The data were expressed in absolute and relative numbers, due to methodological discrepancies among censuses and different data analyses from census to census. Cartographical method was applied for evidence and easy reference to the results. The population figures were compared according to their mother tongue and national affiliation. The territory of the present Vojvodina has been the scene of constant migrations and thus has been populated by various nations from the prehistoric period onward. This has been confirmed by numerous sources from the Paleolithic, Mesolithic, and Neolithic periods (Kovačević 2009). People inhabit the area for favorable living conditions, abundance of water, and fertile soil. Migrations from the eighteenth century until the present time had the largest impact on the present ethnic structure of Vojvodina. War, natural conditions, and political and historical circumstances which altogether led to emigration and immigration resulted in the present ethnic structure which further impacted the population structure by mother tongue. During the reign of Charles VI, the first German immigration started in 1712. Immigration intensified after the Treaty of Passarowitz (Požarevac, Serbia) in 1718 when Count Claudius Florimund de Mercy was appointed the governor of Timisoara’s Banat. Vojvodina was populated not only by Germans but also by Italians, French, and Spanish. The Spanish and Italians settled in Vojvodina for the development of industrial agriculture, vegetable growing, viticulture, and orchard farming. They were important for draining the swamp areas of Banat and also for building roads and bridges. The area of Banat was colonized by 10,000–20,000 Germans, although the exact number of German colonists in other parts of Vojvodina during the reign of Charles VI remains unknown. The German colonization continued during the reign of Maria Theresa and, later, during the reign of her son, Joseph II. In addition to the German colonists, there were Hungarians, Slovaks, Czechs, Bulgarians, Rusyns, Jews, Armenians, Roma, and Arbanasi. Mainly, the colonists were members of the nations from which the Vienna Court could have benefited either politically or economically. During the nineteenth century, colonization of the present territory of Vojvodina continued. Germans migrated to practice agriculture and make crafts. Hungarians, according to Jankulov (2003), practiced vegetable and tobacco farming, whereas Romanians developed cattle farming, and Bulgarians practiced vegetable growing. The Slovaks were considered the best colonists for their reputation of working hard, being persistent, and their satisfaction with little food. The Slovaks were also relevant for the Hungarians regarding cultural and political issues. The Roma were mainly nomadic people, without possession of cattle and without a permanent occupation. Some were smiths, goldsmiths, carpenters, music players, or fortune tellers, but most often they dealt with scrap metal. They most frequently arrived from Romania and Turkey (Mikes 1989; Végh 2012). While colonization of the territory of present Vojvodina during the eighteenth and nineteenth centuries was conducted mainly due to economic issues (to increase the farm land, improve farming techniques, specialize in certain agricultural branches) (Plavša and Bubalo-Živković 2002; Bubalo-Živković et al. 2007), colonization also had a political aim: disuniting the Orthodox population, especially the Serbs and Romanians. The Serbs had been living north of the Sava and Danube rivers prior to intensive migrations in that area during the eighteenth and nineteenth centuries. A larger population of Serbs settled in this area during the Great Migration of the Serbs in 1690 under Serbian Patriarch Arsenije Čarnojević. The Serbs mostly populated the Vojna Krajina (military border) where they received certain privileges. They practiced agriculture but also participated in wars for the Austrian and Hungarian authorities. During the twentieth century, intensive ethnic changes continued; the German population decreased, and the Serbian population increased (Gavrilović et al. 2018). The Russian population arrived in the area after the October Revolution. The Russian population was highly educated; among them were military officers, engineers, doctors, and professors. Most of the Russians who settled in the area at the end of the second decade of the twentieth century continued to practice their professions from their country of origin (Bubalo-Živković and Đerčan 2018). In Vojvodina, intensive migrations occurred after World War II and led to further changes in ethnic structure of the population. The Serbian population was arriving from the mountainous regions of the former Yugoslavia (Stojsavljević 2018). The nations populating the area of Vojvodina brought their languages, culture, and customs, which have been mainly preserved to the present. Nowadays, Vojvodina is an ethnicity, language, and culture amalgam. Most of the ethnic groups have preserved their ethnic identities in Vojvodina. In addition, there were frequent assimilations and mixtures of customs between ethnic groups, which created a cultural core of Vojvodina characterized by unique differences and similarities for which the area is recognizable in Europe (Đerčan 2017; Bubalo-Živković 2017). As previously mentioned, the ethnic mosaic of Vojvodina has been changing through centuries. However, many changes failed to be recorded. The first population censuses recorded by Austria and later the Austria-Hungary Empire were partially conducted on the present territory Vojvodina, which further complicated access to exact numbers on the whole territory of Vojvodina at the same time. The census was conducted on the territory of present Bačka and separately on the territory of Banat. In Banat the census was conducted in 1718 which was the first census in the Habsburg Monarchy for that area, and it mainly recorded the Serbian population. According to the 1720 census, the Serbs made up two-thirds of the population in Bačka. One-fifth of the population was composed of the Bunjevci and the Šokci (Kicošev and Njegovan 2010; Jakšić 1974). During the Ottoman Empire rule from the sixteenth to the eighteenth century, the Serbs were the absolute majority in the territory of present Vojvodina. Due to frequent population migrations in the eighteenth century, the ethnic structure of the population in this area was gradually changing to the end of the nineteenth century. In 1880 one-third of the total population was Serb (35.5%), one-fourth was German (24.4%), and just above one-fifth was Hungarian (22.6%) (Jakšić 1974). A similar ethnic structure was recorded at the end of the nineteenth century (1891) as well as at the beginning of the twentieth century (1910). It was quite difficult to compare the population by mother tongue due to the unavailability of data. From 1918 onward the censuses in Vojvodina were conducted by the authorities of the Kingdom of Serbs, Croats, and Slovenes, and the first census conducted on the territory of the newly formed state was in 1921. The 1921 census figures did not indicate the differences between the number of certain ethnic group members and the number of the members using the mother tongue of that ethnic group. That census defined ethnic affiliation by mother tongue, and there was no difference between the number of certain ethnic group members and the number of members using their mother tongue. In the 1921 census, there was no inquiry about ethnic affiliation. Since the Kingdom of Serbs, Croats, and Slovenes was the state of three constitutive nations, the majority of the population were members of those three nations. Most commonly they were observed as one nation, i.e., the total figures were given for all three nations or joint figures for the Serbs and Croats and separate figures for the Slovenes. 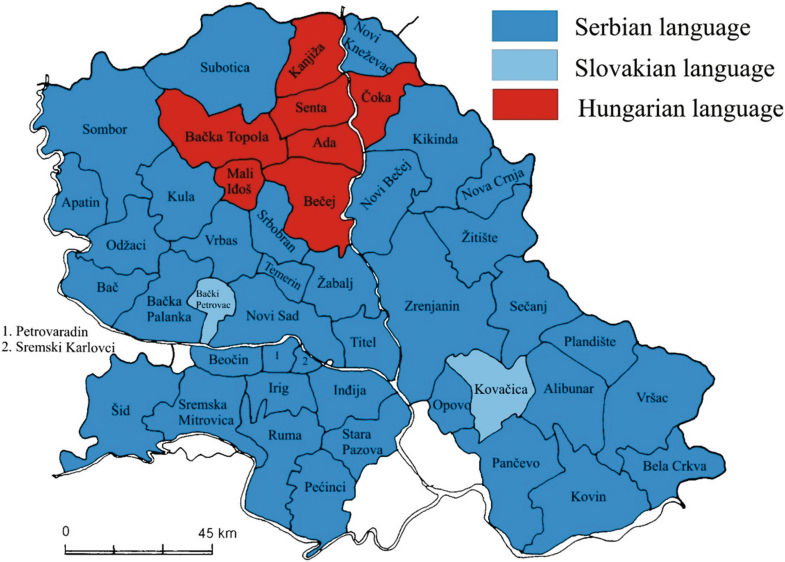 According to the 1921 census, the population using Serbian or Croatian languages as their mother tongues made up 44.0% of the total population of Vojvodina. The Hungarian language was used by 23.7%, and German was used by 21.3%. Other Slavic languages (Slovakian, Czech, Russian, and Ruthenian) were used by 5.2% of the population, and the Romanian and Tsintsar languages were used by 4.8% (Table 1). The listed languages were used as mother tongues by 99.0% of the population of Vojvodina. Other mother tongues, with significantly smaller number of users, were the Arnaut, Italian, Roma, and other languages. Social and political events brought members of various ethnic groups and social classes to the territory of Vojvodina. Some of them managed to preserve their mother tongues and pass it on to future generations. However, some mother tongues slowly disappeared from the area. Among them was the French language, which was not recorded at the 1921 census, although it was known that ethnic groups using it had populated the area. Despite that, the language vanished from the area, in other words, Hungarization of that ethnic group occurred and the group failed to be recorded in official statistical data later in the twenty-first century. Similarly, there was the possibility for the next censuses to record the decrease of certain ethnic groups. Migrations and natural movement of certain ethnic groups played significant roles in the change of population structure by mother tongue in the previous centuries as well in the period after World War II. The first census after World War II (1948) did not have records of the population by mother tongue. But the second census after World War II (1953) recorded major changes in the population structure by mother tongue. Migrations after World War I (i.e., emigration of the German population and immigration of Serbs, Croats, Slovenes, Macedonians, and Montenegrins) changed the ethnic structure of the population in Vojvodina. Emigration of the Germans continued after World War II. The population from mountainous areas in former Yugoslavia settled into the houses that were emptied after the war. According to results of the 1953 census, Serbs comprised about half of the population (49.5%), and Croats comprised about 7.5%. However, the Serbo-Croatian language was used by a higher percentage (61.4%) than the total percentage of these ethnic groups. The Hungarian language was used by 25.5% of the population in Vojvodina, and the Hungarian ethnic group had an approximately similar percentage (25.6%). The Slovaks and Hungarians were two large ethnic groups in Vojvodina (Table 2). A slightly higher number of the population reported use of Slovakian and Ruthenian languages as their mother tongues compared to the total number of members of those ethnic groups. Besides these four languages the census recorded 14 other mother tongues with more than 100 users among the population in Vojvodina. The second half of the twentieth century was marked by major migrations that changed the ethnic structure of the population in Vojvodina. Those were economic-based migrations from rural to urban settlements and larger urban centers. During the 1970s and 1980s, the population was migrating from all former republics of Yugoslavia to Vojvodina. Mass migrations occurred in the 1990s when over 250,000 refugees arrived from Croatia and Bosnia and Herzegovina and settled in Vojvodina. Most of them were the Serbs who were banished from their homes in the period 1990–1995. The largest movements were during the Croatian army offensives “Bljesak” and “Oluja” in Croatia, when the Serbs were leaving Croatia in convoys that were dozens of kilometers long. War activities, thousands of refugees, tough economic situation, sanctions, bombing in 1999, and followed by the refugees from Kosovo and Metohija finally resulted in huge immigration from Serbia and northern province of Vojvodina (Bubalo-Živković et al. 2014). Such social changes, economic crisis, insecure employment, and declining economy were slowly altering the economic structure of the population in Vojvodina (Lukić et al. 2015) and the structure of the population by mother tongue. The Serbs were immigrating and also emigrating from Serbia. Other ethnic group members: Hungarians, Romanians, and Slovaks also emigrated from Serbia; many of them migrated to their countries of origin. In 2002 the share of Serbs in the total population of Vojvodina increased to 65.0%. The share of Hungarians decreased to 14.3%, Croats to 2.8%, and Slovaks to 2.8%, etc. (Table 3). The population structure by mother tongue was slightly different. On this census the Serbian and the Croatian languages are strictly separated, whereas in the older ones, they were treated as a unity. The Serbian language was used by 76.6%, which means that the Serbian language was mother tongue for some members of other ethnic groups, mainly due to mixed marriages. Hungarians, Romanians, and Slovaks use their mother tongues which is not the case with other ethnic groups. For all other ethnic groups, the number of members is higher than the number of those using their mother tongue. It is only the case with the Serbian ethnic group where the number of members is smaller than the number of individuals using the Serbian language as mother tongue. The Serbian language is also mother tongue for most of the Yugoslavs and Montenegrins. According to the 2011 census figures, the population in Vojvodina decreased in comparison to the previous census. The absolute number and share of all ethnic groups decreased, except for the Albanians and the Gorani (Bubalo-Živković 2017). The absolute number of the Serbs decreased compared to the 2002 census, but the relative number increased slightly (66.8%) which was the consequence of decreased numbers of other ethnic group members (Table 4). According to the latest 2011 census, the Serbian language as mother tongue was used by 76.9% of the population in Vojvodina (Fig. 1). The Serbian language was mother tongue for the Yugoslavs, some Slovaks, Hungarians, and Romanians, as well as some other ethnic group members, especially those born in mixed marriages. The German language as mother tongue was used by the 0.1% of the population that were descendants of the Germans who once comprised over one-fifth of the population in the area. However, the majority of Germans, due to collaboration with the German military administration during World War II, left the county at the end of the war. The endangered languages were those used by only a small number of certain ethnic group members. The best example is the Vlachs in Vojvodina. The Vlachs inhabited the eastern part of Central Serbia and Romania in larger numbers, and their language was not endangered. However there was a huge problem of foreign expression overuse (Anglicisms, Germanisms, and Romanisms) in mother tongues, which repressed the words and expressions in mother tongues (“Nurtured” 2015). As the above analysis indicates, the Serbian language is dominant in the territory of the Republic of Serbia, as well as in its northern region, Vojvodina. Serbian belongs to the Indo-European family of languages that is widely spoken around the world. The subgroup within this family is the Slavic group of languages to which the Serbian language belongs (Lukić et al. 2017). Most Slavic language users are in Europe. The Serbian language is spoken by about 8.5 million users and is the only language with two scripts – Cyrillic and Latin. The problem of decreased use of one of the most perfect scripts (Cyrillic script) in the world emerged when typewriters with Cyrillic script were banished during the presidency of Josip Broz Tito. With this act mass use of the Latin script was introduced to Serbia. Today, an additional problem for underuse of Cyrillic script is the mass use of Latin script in applications and programs on personal computers and mobile phones. The essence of Serbian Cyrillic script is well-described in a famous quote of Vuk Stefanović Karadžić – “write as you speak and read as it is written” (Stefanović-Karadžić 1849, p. 10). In Cyrillic script, one letter is used for one sound. Vuk Stefanović Karadžić greatly contributed to the preservation of Serbian language and script by writing down many folk songs, stories, short stories, proverbs, riddles, and pieces of Serbian folk wisdom which he saved from oblivion. He improved the Serbian Cyrillic script to the level in which one letter is used for one sound. However, when we observe the Serbian language as mother tongue for the majority of people in Serbia along with languages of national minorities in Serbia, domestic linguists are of the opinion that there is a threat of English language overuse similar to its threat to other languages with long tradition (French, Italian, or German). When the Serbian language is in question, linguists think that we should pay more attention to our mother tongue, development of language culture, and tradition preservation (“Mother’s Day” 2018). Modern technology, increased Internet use, and globalization processes introduced certain new words of foreign origin into the mother tongues in the area. Those words are frequently used on the internet, social networks, etc. and have become popular among the younger population, but the older generation disapproves of using those words. Although the official language in Serbia is Serbian and the official script is Cyrillic, use of the script is declining on TV, in newspapers, books, etc. Only one public TV broadcaster uses the official Cyrillic script, whereas other TV broadcasters use the Latin script. The street and shop commercials are also in Latin. That is a way of neglecting Cyrillic script, since all know that the young population uses computers, the Internet, and smartphones with Latin script keyboards. Therefore, it is necessary to direct activities toward increasing the use and preserving Cyrillic script and Serbian language. In 2006 Serbia ratified the European Charter for Regional or Minority Languages and pursuant to the Constitution of the Republic of Serbia and Law on Official Use of Language and Script, the official language in the Republic of Serbia is the Serbian language, and the official script is Serbian Cyrillic. Besides the Serbian language, in territories of local self-government units where national minorities live, their languages and scripts may be equally used for official purposes. The units of local self-government may also regulate, by their statutes, equal use of the language, and script of a national minority if the share of the national minority in the total population reaches 15% according to the latest population census figures. Moreover, the national minorities whose share in the total population of the Republic of Serbia does not reach 2% according to the latest population census figures may report to the state authorities in their mother tongue and get answers in that language through the local self-government in which the minority language is officially used (Official Gazette of the Republic of Serbia, No 45/91). The Statute of AP Vojvodina (Official Gazette of APV, No 20/2014) stipulates that the Serbian language and the Cyrillic script shall be in official use in authorities and organizations of the AP Vojvodina, as well as Hungarian, Slovakian, Croatian, Romanian, and Ruthenian languages and their respective scripts. In addition, paragraph 2 also prescribes that authorities of the AP Vojvodina, within the scope of their competences, shall undertake measures aimed at consistent implementation of the official use of languages and scripts of national minorities-national communities, laid down by law (“Official Use” 2018). According to the law on official use of language in the Republic of Serbia and Autonomous Province of Vojvodina, each municipality in this northern region of Serbia officially uses the mother tongues of the national minorities which live on the territory of the municipality in larger numbers. As can be seen in Fig. 2, the municipalities with homogenous ethnic structure (Opovo, Pećinci, Ruma, Irig, Inđija, and Sremski Karlovci) use only Serbian language officially. The largest number of official languages in use is recorded for the municipality of Bačka Topola (Serbian, Hungarian, Slovakian, and Ruthenian), the municipality of Šid (Serbian, Ruthenian, Slovakian, and Croatian), the municipality of Pančevo (Serbian, Hungarian, Romanian, Bulgarian, and Macedonian), the municipality of Plandište (Serbian, Hungarian, Slovakian, Ruthenian, and Macedonian), the municipality of Zrenjanin (Serbian, Hungarian, Slovakian, and Romanian), and the municipality of Bela Crkva (Serbian, Hungarian, Romanian, and Czech). As is observed on the map, the largest numbers of official languages in use are recorded in the municipalities of the southeastern part of Banat and western and northern parts of Bačka, which is due to the presence of ethnic groups from neighboring countries, as well as migrations that occurred during past centuries. Minority children receive education in their mother tongues and in cases when it is not possible, due to a small number of pupils, they at least have a school subject Mother Tongue with Elements of National Culture. According to the Office for Human and Minority Rights in Serbia, over 10,000 children receive education in 10 minority languages. In primary schools education is performed in 13 minority languages for over 45,000 students, whereas in secondary schools, over 13,000 students receive education in minority languages. There are over 100 public media in 16 minority languages in Serbia. In 42 local self-government units, about 10 minority languages are in official use. The children in primary, secondary, and tertiary education may use textbooks written in their mother tongues. The textbooks are printed not only in Serbian but also in Hungarian, Slovakian, Russian, Ruthenian, Bulgarian, and Macedonian (“Statute” 2014; Službeni glasnik Republike Srbije; Fig. 3). These languages are most frequently used in certain municipalities. In Vojvodina students who are members of national minorities may attend school in their mother tongue. Assignments in schools as well as final exams are conducted in mother tongues. Entrance exams at universities are also conducted in mother tongues. This approach in education is favorable for members of national minorities but also has certain disadvantages. It is sometimes possible for children to grow up within a community where all members speak the language of a national minority, finish their education in that language, and listen to radio or TV programs in that language as well. When they grow up, they face not being able to speak the official language of the country they have lived in, i.e., they cannot speak Serbian. Another problem arises if they select a major that does not offer the option of attending lectures in their mother tongue, which means they start learning Serbian when they reach their mature age. Publishing in languages of national minorities has had a long tradition in Vojvodina. National minority members have the right to publish newspapers and magazines in languages of national minorities (Table 5; Fig. 4). In Vojvodina, national minorities have two monthly newspapers (Ukrainian and Bunjevci dialect), five weekly papers (Hungarian, Slovakian, Romanian, Ruthenian, and Croatian), and one daily paper (Hungarian). Publishing in Romanian language is done by the Libertatea newspaper and publishing company in Pančevo, and publishing in Ruthenian language is done by the publishing company Ruske slovo. Publishing and printing enterprise Kultura in Bački Petrovac publishes the quarterly Magazine for Culture and Art Nový život and weekly magazine Hlas ljudu in Slovakian language. Daily newspaper Magyar Szó, weekly magazines Hét Nap and Családi kör, and also Híd, magazine for literature, art, and social issues are published in Hungarian. Weekly magazine Hrvatska reč is published in Croatian language in Subotica. Besides the daily newspaper Magyar Szó and weekly magazine Hét Nap, there are magazines for children and youth: weekly magazine for children Jó Pajtás, youth magazine Képes ifjúság, and monthly children’s magazine Mézeskalács in Hungarian. Magazine for children Bucuria copiilor is published in Romanian language, as well as the magazine for youth Tineretea. Magazine for youth Mak and magazine for children Zagradka are published in Ruthenian language. Publishing of newspapers for children has started recently: Tandrčak – in Bunjevci dialect, Solovejko – in Ukrainian language and Sunica – in Macedonian language and magazine for youth Kužiš?! – in Croatian language. All newspapers are mainly distributed in settlements with the population of national minorities and serve as a form of preserving mother tongue as well as using the language rights of various national minorities living in Vojvodina. One of the most prominent features of newspapers in minority languages is that they cover cultural, political, and economic topics not only from Vojvodina and Serbia but also important events from mother countries of minorities. Most of the magazines are published in Novi Sad, Subotica, Pančevo, Bački Petrovac, Zrenjanin, Vrbas, Sremski Karlovci, Sremska Mitrovica, and Senta. On Radio-Television Vojvodina, national minorities have TV shows in their mother tongue (Fig. 5). Some theaters have plays performed in the mother tongue, including one In Novi Sad that produces all the performances in Hungarian (see Fig. 5). 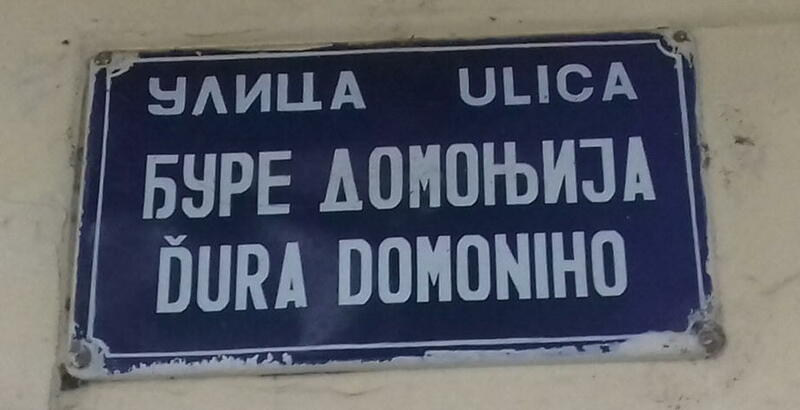 In settlements with inhabitants of certain national minorities, street names (Fig. 6) as well as information boards in administrative buildings, shops, pharmacies, and the post office are written in Serbian and in national languages (Fig. 7). This shows that national minorities in Serbia have all the benefits of preserving their language and national identity. Serbia is a country with population belonging to various ethnic groups. Especially versatile regarding ethnicity is the northern province of Vojvodina, where there are over 20 ethnic groups and 17 mother tongues in use, with over 100 users each. If ethnic groups and mother tongues with less than 100 users are taken into account, then the total number of 45 ethnic groups and 33 mother tongues is reached. Such ethnicity mosaic was formed as the result of centennial long migration processes, either forced or organized on the one hand, or elemental and unorganized on the other. Some of the migrations were caused by economic events, wars, political, religious, and ethnic factors. Such large number of ethnic groups led to the largest number of mother tongues being used officially in the north of Serbia. During the twentieth century and at the beginning of the twenty-first century, changes occurred in the ethnic structure of the population, as well as in the population structure by mother tongue. Serbian was the dominant mother tongue at the beginning of the twentieth century, while Hungarian and German had a considerable share of users. The share of the population using the Serbian language as mother tongue significantly increased by the beginning of the twenty-first century, whereas the shares of the population using Hungarian and German as mother tongues decreased, especially for German. Despite these major changes in the north part of Serbia, still a large number of different mother tongues are being used. Mother tongue and script are important factors in preserving national identity, customs, and cultural values of each ethnic group. Therefore, it is crucial to preserve the identity of each ethnic group that altogether form ethnic and cultural mosaic of immense importance. In case certain parts of the mosaic disappear, it would create a great loss for the area. The people living in Vojvodina benefit from the rich multicultural environment, which includes use of both Cyrillic and Latin scripts. The population has the right and opportunity to receive education in their mother tongues, from preschool institutions to secondary schools with provided textbooks in mother tongues. Also, the entrance exam for the faculty is provided in various mother tongues. Moreover, daily newspapers are printed in mother tongues of various ethnic groups. Court trials may also be conducted in mother tongue. All this indicates the democratic approach and freedom of ethnic affiliation of every nation and national minority in Vojvodina, i.e., all ethnic groups have equal rights as the Serbs, who are the majority population. Funding was provided by the Provincial Secretariat for Higher Education and Scientific Research of the Vojvodina Province, Republic of Serbia – Project No. 142-451-2356/2018-01. “Mother’s Day” (Today is Mother’s Day). (2018). Government of the Republic of Serbia, Office for Human and Minority Rights. Available at http://www.ljudskaprava.gov.rs/sh/press/vesti/danas-je-dan-maternjeg-jezika. Accessed May 14, 2018. “Nurtured” (The Mother Tongue Must be Nurtured). (2015). PTC Radio-Television Serbia, February 21, 2015. Available at: http://www.rts.rs/page/stories/sr/story/125/drustvo/1836841/maternji-jezik-se-mora-negovati.html. Accessed May 14, 2018. “Official Use” (Official Use of Languages and Letters). (2018). Republic of Serbia, Autonomous Province of Vojvodina. Available at: http://www.puma.vojvodina.gov.rs/etext.php?ID_mat=26. Accessed May 14, 2018. “Statute” [Statute of the Autonomous Province of Vojvodina]. (2014). Republic of Serbia, Autonomous Province of Vojvodina. Available at: http://www.skupstinavojvodine.gov.rs/Strana.aspx?s=statut&j=SRL. Accessed May 14, 2018.